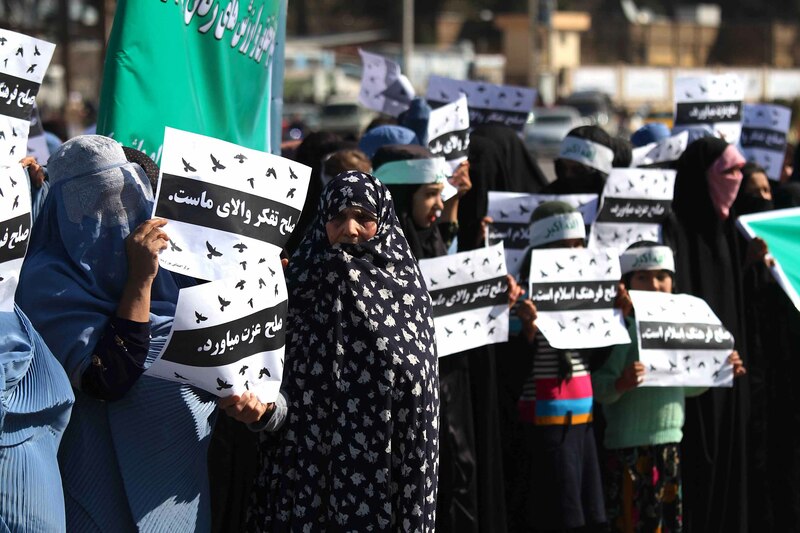 KUNDUZ -- About 100 children and teenagers gathered at a rally in Kunduz Province Tuesday (February 26) to demand that the Taliban put down their arms and agree to a sustainable peace in Afghanistan. The rally followed the start of three days of meetings Monday (February 25) between US Special Representative for Afghanistan Reconciliation Zalmay Khalilzad and the Taliban's top political leader in Doha on peace in Afghanistan, the result of a months-long diplomatic push. 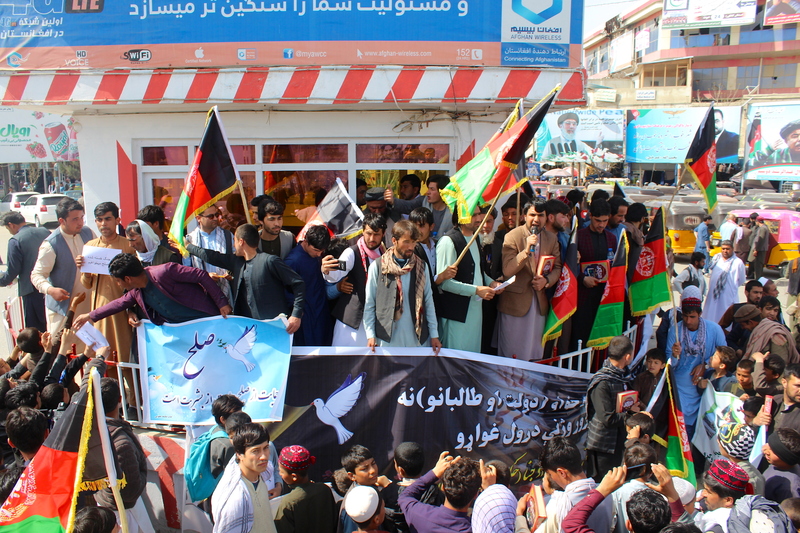 Youth of different ages united at the Mediothek Social Centre in Kunduz city to call upon the Taliban to respond to the Afghan government's peace offer and join the peace process. "With these messages, we want to show to the world how much we hate the war and bloodshed that have been going on in our country," Ahmad Omid, 13, a fourth-grade student at Hazrat Ali High School in Kunduz city, told Salaam Times. "Most of the war victims are children. The war should end, and the Taliban should make peace," he said. Rahima Hafizi, 13, a fifth-grade student at Sher Khan High School in Kunduz city, lost her father in an attack by the Taliban. "Now only my mother is able to take care of me," she told Salaam Times. "The war destroyed many homes. Women lost their husbands, children lost their parents and mothers continue to suffer." Rahima said her dad was killed after the Taliban seized Kunduz city for a brief time in 2016. "My father lost his life in a Taliban mortar attack," she said. "The round hit our house, and my brother was injured." The Taliban should respect the demands of peace negotiators, Aziza Amini, 19, a civil society activist in Kunduz, told Salaam Times at the gathering. "We ask for an immediate ceasefire, an end to the war and sustainable peace in the country," she said. Adults at the rally appealed for Afghans, including elders and religious leaders, to be more vocal in the call for peace. "Tribal elders, religious scholars, imams of mosques and Afghans from other walks of life should call upon the Taliban to observe a ceasefire and end the war through gatherings and sermons in mosques and schools," Nasiba Holkar, head of the Women's Affairs Directorate in Kunduz Province, told Salaam Times. "The Taliban should respect the legitimate demands of the Afghan people," she said. The peace talks "shouldn't overlook the achievements Afghan women have made in the past 18 years" since the war with the Taliban began and women "should be honoured" in the negotiations, Malalai Saad, 43, said. 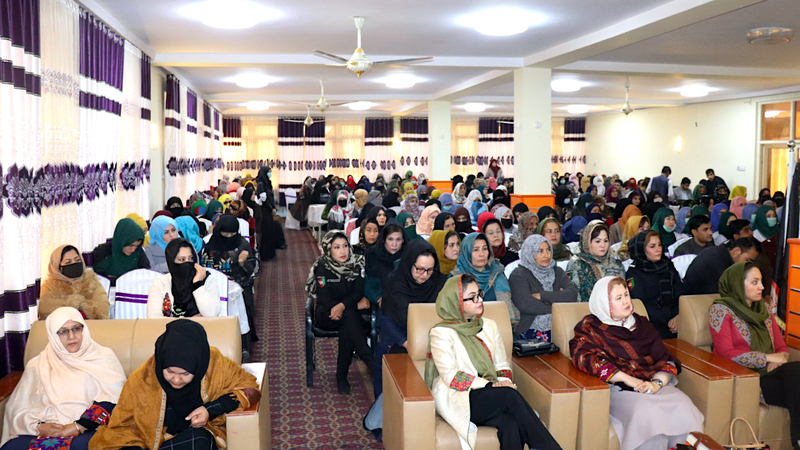 "As we can see, the talks are proceeding really well, and both sides should try to take into account the interests of the Afghan people and ensure sustainable peace in the country," Saad, a women's-rights activist in Kunduz Province, told Salaam Times. The youth rally came on the heels of a meeting of about 100 athletes in Kunduz city on February 23. They put on sports demonstrations at the Kunduz provincial government compound while calling for lasting peace in the country. "We want the Taliban to stop killing their brothers and to join the government and the peace process," said Ahmad Shakaib Elham, 36, one of the athletes at the event. "Do not let the country suffer more misery and destruction." He attended the gathering to show his support for security forces and the government, he said. "Young sportspersons have been on the government's side at every kind of situation, and they have been great supporters," he told Salaam Times. "Sportspersons are the ambassadors of peace, and the Taliban should understand that we all are in grave need of peace." The violence inflicted by the Taliban over the years has had "consequences as it destroys every part of our society, and it has instilled hatred and distrust in our youth", said Amruddin Wali, a member of the Kunduz Provincial Council who attended the rally. "Most of the victims of war are young," he said. "Right now, young Afghans are defending our country on our noble fronts, and their only goal is to protect our territorial integrity and the prosperity of the people." "Those who make peace renounce violence and think about bringing peace, prosperity and development to the country," he added. "They are not like the enemies of Afghanistan who victimise sons of this country on a daily basis."